BANFF, ALBERTA, Canada – Experience the rugged beauty of Banff and Lake Louise on one our acclaimed backcountry snowmobiling tours. Our adrenaline-filled snowmobile tours offer an unforgettable Canadian Rockies experience you’ll remember for years to come. We offer a wide range of options to suit any needs. Looking for that essential Canadian Rockies experience? Join one of our awesome snowmobiling tours today. This classic Canadian winter sport is designed for all skill levels and is easy to master in a day. Our professional guides bring you to some of the most remote parts of Banff, Alberta where you’ll be able to take incredible photos of Canadian wildlife as you sip on a steamy cup of hot chocolate. Combine your snowmobiling adventure with a Zipline Tour for a truly memorable Canadian Rockies experience! Our snowmobiling courses are easily accessible just 65 minutes from Banff, Alberta. 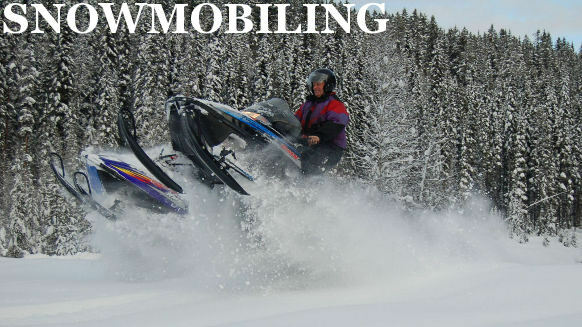 We provide state-of-the-art snowmobiling equipment designed for your safety and comfort. All guests receive boots, helmets, suits, snacks and beverages. Reserve Your Banff Snowmobiling Adventure Now! We provide you with all the necessary gear and newer model snowmobiles on your Banff snowmobiling tour. We also offer the option of free hotel shuttle service to the launch site, or you can just meet us there. Banff snowmobiling tours offer a fun filled adventure whether you’re with a couple, family or large group. We have custom tours and snowmobile tours for corporate outings. Meet us at the site or take our free hotel shuttle. We operate from November through April. Book with us directly to avoid agency surcharges! Watch this out this cool video from All Season Adventures ! At All Season Adventures, we want you to enjoy your Banff snowmobiling tour to the fullest! Safety is a major concern for us. We require all participants to wear a helmet because they protect you from potentially fatal injury. When climbing hills, use extreme caution and be wary of hidden cliffs. Always check with your guide before scaling an unfamiliar hill and don’t be afraid to ask questions.